Red beets are known by a whole host of names, including the garden beet, the table beet, and just the plain old beet. One of the most popularly encountered types of beet in all of the continent of North America as well as Britain, red beets are just one of the many cultivated types of beets. Most of the time, the roots of red beets are boiled and then consumed as a cooked vegetable or eaten cold as part of a salad, after you have cooked them and added vinegar and oil. In foreign countries like those in Eastern Europe, adding red beets to soup as part of beet soup is a very popular part of cooking. In this list, you will discover the 3 reasons you should be eating red beets. Red beets have been proven to be a source rich in essential vitamins like vitamin C. Vitamin C is widely known as a potent combatant against the common cold, and while it has been shown to reduce the frequency with which people catch that illness, vitamin C, however, fails to do anything regarding reducing the severity or the duration of the common cold in people. Vitamin C also guards against nasty diseases like scurvy, which will occur if you are vitamin C deficient. Scurvy manifests itself physically through spongy gums, spots on your skin, and even bleeding from your mucous membranes. Some debilitating effects of scurvy are the feeling of depression and even physical immobility. 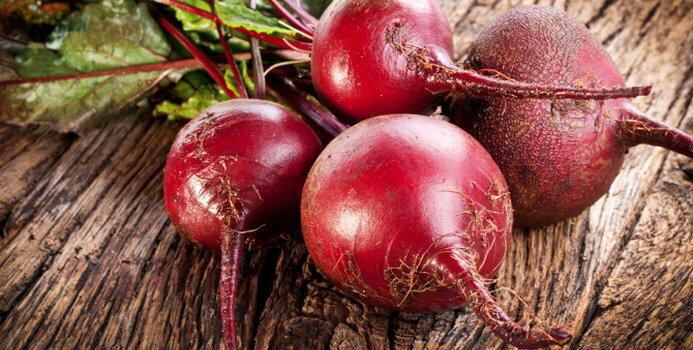 Another nutrient that red beets are a rich source of is betaine; betaine is vital to good cardiovascular health. Betaine's purpose is to lessen your body's concentration of homocysteine, a substance which is hurtful to your blood vessels in the sense that it can contribute to peripheral vascular disease, stroke and heart disease. Moreover, there is decent, scientific data to indicate that betaine is also beneficial for the purpose of shielding you against liver disease. It does this by way of acting to lessen fatty deposits in your liver, especially those that have been brought about through diabetes, alcoholism or protein deficiency. A final benefit of betaine is that it actually raises your levels of stomach acid, helpful to those who suffer from hypochlorhydria. The juice from red beets, beetroot juice, has been actually shown to reduce high blood pressure, a godsend for people with hypertension and those looking to avoid cardiovascular dilemmas. The effects on high blood pressure are apparently so potent that information published in the journal Hypertension, a publication from the American Heart Association, established that consuming 500 milliliters of beetroot juice resulted in a measurable reduction in hypertension in just an hour. These beneficial results lasted even up to 24 hours after such beetroot juice drinking. Scientifically, the credit goes to the high content of nitrate that is present in the beetroot juice.